A weedy Eurasian species, not often cultivated, well established in disturbed ground such as roadsides, fields, dumps, farmyards, and gravel pits; clearings and disturbed forests; often on shores. First collected in 1860 in Washtenaw Co. The corolla is usually ± reddish, becoming more purple in age (or upon drying). White-flowered plants have been collected in Michigan but are apparently very rare. This species is not only much more leafy than C. boreale but also has more branches to the inflorescence. The upper leaves are often merely sessile. 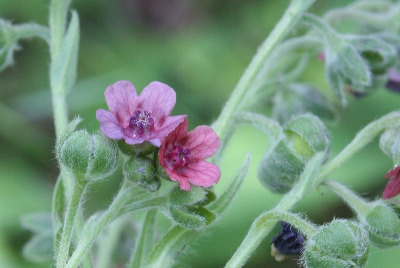 The pubescence is quite soft, compared with the very rough Anchusa officinalis, which furthermore has bracted pedicels but is sometimes confused with hound’s-tongue. MICHIGAN FLORA ONLINE. A. A. Reznicek, E. G. Voss, & B. S. Walters. February 2011. University of Michigan. Web. April 24, 2019. https://michiganflora.net/species.aspx?id=568.